"West Chester Story Slam is a mix of brilliant comedic awesomeness and Philly sport fan-style rowdiness." - Steve Clark, Two-time "Best Storyteller in Philadelphia" "The live stories are heartbreaking and hilarious. West Chester Story Slam is a great night out for anyone who loves a good story." - Kelly Simmons, author of The Bird House "West Chester Story Slam is a fun live event powered by the insightful tales of impressive storytellers." - John Dixon, Author of Phoenix Island, the inspiration for CBS's Intelligence "West Chester Story Slam is just one more reason to love life in the borough." - West Chester Mayor Carolyn Comitta Since West Chester Story Slam launched in 2010, over five hundred stories have been told live on stage in front of rowdy audiences at local bars. Stories are told with no notes and no props, just a storyteller standing at a mic, revealing themselves through their personal tales. Selected stories include: Eli Silberman's tale of a television commercial shoot gone horribly wrong. Luke Stromberg documents his life in crime and Luanne Sims tells about her worst day as an adult diaper salesperson. Read about Terry Heyman's short-lived fling with an Oscar-winning actor, Kyle Hudson's brush with legendary movie icon Bill Murray, and Carole Mallory's late night search for the grave of Pablo Picasso. Learn about Queen Elizabeth's corgis, raising pigs, and high level miscommunication at the world's largest home shopping network. 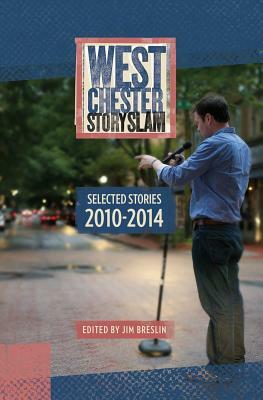 Jim Breslin, editor, is the founder of the West Chester Story Slam and the author of two books, Shoplandia and Elephant: Short Stories and Flash Fiction. He is the host of the West Chester Story Slam podcast, available on iTunes.